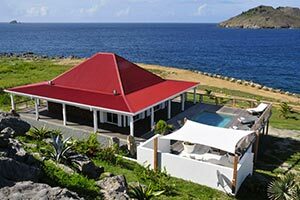 Villa UJV 171, also known as Villa West Indies, is a spacious one bedroom villa located at the far end of Flamands beach, St Bart's. This popular villa offers panoramic sea views and is steps from the beach. Perfect choice for honeymooners. The main level, completely open to the ocean view and breezes, features the wonderful bedroom with ensuite bathroom, gourmet kitchen, indoor dining room and comfortable living room with white sofas. Every room is connected and opens onto the wrap around deck with heated pool and to the outside dining and living areas. The sunny terrace that surrounds the villa invites you to relax in deckchairs while enjoying the view. This amazing villa is the perfect choice for a relaxing vacation near the beach!